2009's The Chair in the Doorway was an interesting discovery for me. For years, fans had held out hopes for a Living Colour reunion after the long hiatus that followed the release of 1995's Stain. Each member of Living Colour kept busy on other musical projects, of course, but the fans unsurprisingly wanted that fix that only LC can give them. Eventually, it happened, for a series of concerts that - at least, according to the message boards I read back then - received mixed reviews. Most critical reviews focused on the band's new-found techno influences, the likes of which had been guiding guitarist Vernon Reid's other projects for quite some time. Still, these concerts must have been successful because they set the stage for 2003's Collideoscope, an aggressive album that solidified the band's electronica influences. 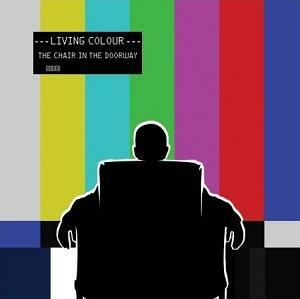 I bought that album as soon as it came out, then I never heard anything from Living Colour for a long time. Eventually, I was browsing a CD store and came across what appeared to be a new Living Colour album. This was the internet age, and yet somehow the release of this album had escaped me. I flipped the CD around to view its back cover, only to be shocked by the discovery that the album had been released years earlier, in 2009. As a loyal fan, I felt a pang of guilt for not having followed the band well enough to even stay on top of their latest releases. Musically, The Chair in the Doorway is much more accessible than its predecessor. While all of the band's trademarks are on full display - including their electronica and hip-hop influences - the songs display a much more "radio-friendly" songwriting approach. (I use that phrase hesitantly, since Living Colour is not what anyone would call a radio-friendly band.) The production on the album is rather dry, and the mixes are "in your face." This, too, is a slight contrast from Collideoscope, but much more in line with Stain or Time's Up. What's really interesting about The Chair in the Doorway, though, is the "aural focus" of the material. By far, the two most famous members of the band are guitar-god Vernon Reid and absolutely legendary bass player Doug Wimbish. And yet, on this record, their (still excellent) instruments seem to take a back seat to William Calhoun's drumming and Corey Glover's vocals. This is, of course, no detriment to the music, as both are virtuosos of their respective instruments. And, in particular, Glover's voice is absolutely brilliant on this album. True Living Colour fans have always been in love with his voice, but The Chair in the Doorway is a cut above in that regard. Glover may never have displayed the strength of his upper register to the extent that he does on this record. I mean, the range is astounding! It's not all high notes, of course, and Glover is able to emote even when singing relaxed and emotionally complex pieces like "Method." Despite ready-made Living Colour classics like "Behind the Sun," which sounds like it could have come from the Time's Up sessions, and "Young Man," which could reasonably appear on any of the band's prior releases, this album really feels like The Corey Glover Show to me, and I mean that in only a good way. This album is an answer to anyone who ever felt lukewarm toward the singer of this, one of my most very-favorite bands. Long story short, this is an album that cannot disappoint even the most discriminating of Living Colour fans, and represents a strong and indelible contribution to the band's oeuvre.